Should You Buy a Metal or Plastic Kettle? 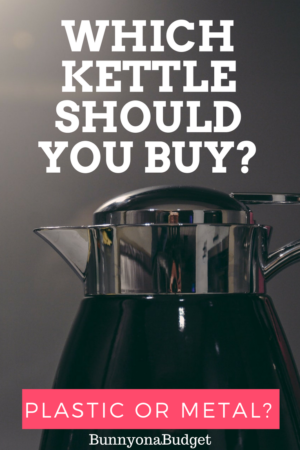 Buying a new kettle should be one of the simplest tasks you can do. However, there are so many different options to choose from when shopping for a kettle nowadays, such as deciding between an electrical or a stove top kettle or choosing between a modern, retro or heritage look. However, I think that the hardest choice to make is whether to buy a metal kettle or a plastic kettle. The reason I say this is because it is pretty straightforward to pick between an electrical or stove top kettle as it depends on whether you have the time and patience to wait for the stove top kettle to boil. Also, to choose between modern, retro or heritage looks totally depends on your style in the kitchen. You often get more choices with metal kettles. Plastic kettles appear to be of a lower quality. Metal kettles are more expensive so should be better kettles. Plastic kettles are cheaper but not as stylish. But are these thoughts and opinions true? Well, I recently went through the process of shopping for a new kettle. My last two kettles have been metal kettles from the Russel Hobbs Legacy range* that cost around £49.99 at the time and I absolutely loved them! They looked really good in the kitchen and worked amazingly. However, I ended up giving the first one away after having it for about 5 years as it had gotten all scratched and rusty and was looking a bit worse for wear. Like I said, I really loved the kettle though, and I put the scratches down to the fact that I hadn’t packaged it up very well when we moved house. So, I wanted to buy the exact same kettle again, but this one wouldn’t get bumped around in the back of a removal van. Unfortunately, even though we haven’t moved house since buying the second metal kettle this one also started to look a bit scruffy after only a year. The cream paint layer over the top had started to bubble, and if you accidentally knocked it, the bubble would burst and the paint would start to peel. Also, the rim around the top of the kettle had been knocked a couple of times when filling it with water and so it had started to scratch and rust from that area too. Now, the problems that I have found with metal kettles might not be something that everyone will experience. This is because both me and my husband work from home a few days during the week, so it may just be that our kettles get more than the average use (due to our constant cups of tea and coffee) and so start to show signs of premature wear and tear. Also, we have to keep in mind that I have only used metal kettles with a coloured finish over the top, so I can’t say how a plain stainless steel kettle* would fair. After putting up with the bumps and scratches for a while I finally decided that it was time to try something new. A plastic kettle! I had always thought of plastic kettles as being a bit on the cheap and boring side. However, there are more and more brilliant plastic kettles coming to the market. Instead of them just being your budget kettle that costs under £10 there is now a huge variety of styles, colours and prices that means that pretty much everyone can find one to suit their needs and styles. I decided to buy the Breville Impressions kettle* in cream for under £30 and I absolutely love it. It is lighter than the metal kettle, but it works just as well, and it definitely doesn’t feel that I’ve compromised on the quality of the kettle by choosing a plastic one. Best of all though, it is still immaculate after a few months of constant use! So, I think that what you need to bear in mind when buying your next kettle is that every kettle is different, you can choose a top end kettle for over £100 or you can pick a budget kettle* for just £10. But don’t feel put off buying a plastic kettle if you’re worried about the quality or style. From my own experience I can tell you that I am over the moon with my new plastic kettle. Is it Worth Spending More on Organic Cosmetics & Toiletries? How Much Should I Spend to Kit My Kids Out For School? Today is the day to pick up a ‘Bag for Life’!